In 2013, Trilobyte Games went to Kickstarter in search of $435,000 in funding for The 7th Guest 3: The Collector. That effort failed. In 2014, it aimed its sights lower, going for $65,000 on Crowdtilt, and again fell short. Today, however, a fan-made semi-sequel called The 13th Doll actually made it across the Kickstarter finish line, and there are still two weeks remaining in the campaign. A bit of history is probably in order. 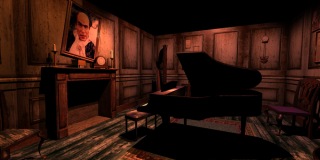 The 7th Guest was a point-and-click adventure released in 1993, during the early days of CD-ROM technology. Like Myst, it was designed specifically to take advantage of that technology, and helped push its adoption among mainstream PC users. It was also a critical and commercial success, although in hindsight that's probably because it was so technically dazzling, and not because it was a particularly good game. A sequel, The 11th Hour, was released a couple of years later, but didn't fare nearly as well. The 13th Doll follows the events of The 7th Guest, and part of it actually takes place within Stauf's mansion, the setting for the original game. This is possible because, earlier this year, the makers of the game were offered a licensing deal by the owners of the property: If they could achieve their Kickstarter goal of $40,000, they would be allowed to sell the game commercially. "The license deal we have requires that we find funding in order to make a high quality game that represents the franchise well. Of course, that was always our goal, but funding also allows us to secure better actors, use better equipment, and create a more immersive experience," the developers, working under the name Attic Door Productions, wrote in the Kickstarter pitch. "Much of the challenge of making this game is that we depend on volunteers, who work on the game in their spare time. Thus development progress is often uneven. Life, jobs, families, illnesses, newborns, etc. often delay development. Funding the Kickstarter will allow us to work on this game full time so we can focus on creating content, and assure a release date within the year." It's an unusual situation when the makers of a game can't find crowdfunding for a sequel, but a fan-based effort to do the same thing can pull it off so easily. The first Kickstarter for a new 7th Guest was probably a little over-optimistic—the Shadowgate Kickstarter, which I would say is comparable in most ways that count, had a goal of just $120,000—but the Crowdtilt campaign goal was much closer to that of The 13th Doll. Maybe it suffered from being on a non-Kickstarter platform, or maybe Trilobyte's inability to produce a worthwhile followup at any time during the pre-Kickstarter years put off potential supporters. Whatever the case, with the base goal achieved, stretch goals now come into play, including Open House mode, Classic Navigation mode, Oculus Rift support, and my favorite, "No Debt For Developers." With a full two weeks left in the campaign, I imagine that at least a few of them will be hit. The 13th Doll Kickstarter will continue until August 27, while the game itself is expected to be ready for release either late this year, or early in the next.